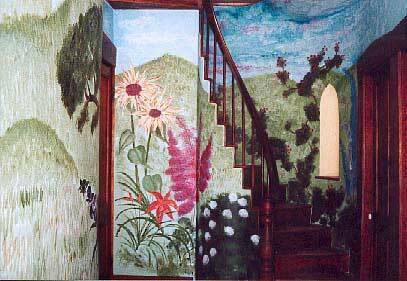 The front hall at Sculptured Rocks Farm has come to life with an impressionist style mural covering every inch of wall space and ceiling too. 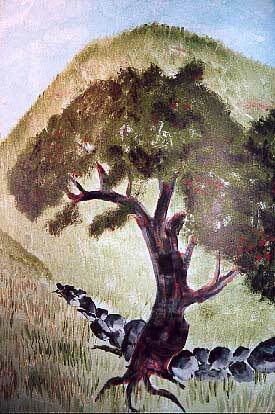 The mural depicts a stylized view of the area surrounding the Sculptured Rocks Farm. 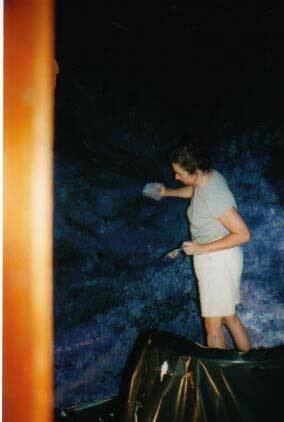 This has been Dawn's project starting in mid December and finishing the first of March 2002. Everyone says, "Dawn, I didn't know you were an artist". Well I did study art and don't have a lot of time to paint, but I had so much fun doing this project I think I will be carving out more time in the future. 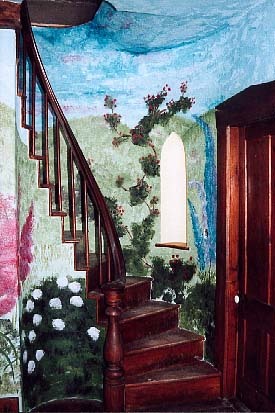 The mural now continues up to the second floor hall as a night time sky, inspired by the mural seen in an elegant house at Sturbridge Village. I wanted to make it truly historically correct by having a few sheep grazing in the field as they would have been during George Hikel's day, but Michael vetoed the sheep. Too baaaahd! 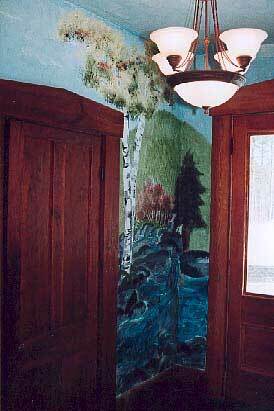 Dawn continued the mural up to the second floor hallway, complete with the milkyway. Above she is working on the project. Michael is going to add the constellations as soon as his busy schedule allows (we thought a bathroom door was more important). Sculptured Rocks Farm was once a thriving family sustenance farm. So we gave tribute to the famous apple orchards in the mural. In a clipping from a newspaper advertisement of 1894 Artemus describes his property for sale (at $1,100) as including an "orchard grafted with early and late fruit". Obviously this was an important part of the farm at that time and we hope to salvage some of the many trees that have been left uncared for for over half a century. Last fall we started in producing some very fine apple liquor from the trees right outside the kitchen window.